February 6, 2016: Anthony coordinated a wonderful breakfast run featuring amazing vehicles from Palm Desert to Anza via Hwy 74. We were about to leave when this vehicle arrived at Paradise Valley Cafe. Lanny had been at "Cars and Coffee" in Indio at "Sip" coffee shop, a fun meet with Andreas Somogyi from Overhaulin'. This car had been on "Overhaulin'" two years prior. Video can be found by searching Lanny's Fairlane and Overhaulin'. 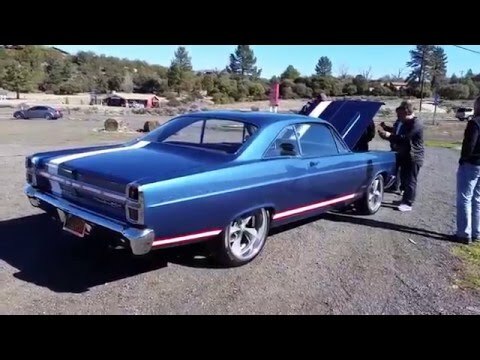 We had a ton of fun checking out this car! The wind had just kicked up so the audio is spotty but the fun, appreciation of the vehicle and the laughter is infectious! Enjoy. :) It's VERY cool! www.HotDesertMopars.com is my site with tons of fun.